Hi, hello, please pin this right away. You know, to that Easter Recipes board you have going, where you’re totally swamped with glazed ham recipes and all the deviled egg photos look the same? That one. Because you’ve found her! The best ever, perfect deviled eggs recipe. I mean, perfect deviled eggs with bacon recipe. Because just a smidge of bacon makes everything better, doesn’t it? Speaking of making things better, I added butter. I did it! I regret nothing! You can’t make me sorry! Sounds weird, right? But just roll with it for a second. Softened butter helps fortify the egg yolks, making them creamier and richer than you’ve ever tried. Don’t even doubt it! Just do it. You’ll thank me on Instagram later with a bunch of “nailed it” stickers on top of the photo showing these off to your jealous friends and fam. I’m that confident! And the bacon? 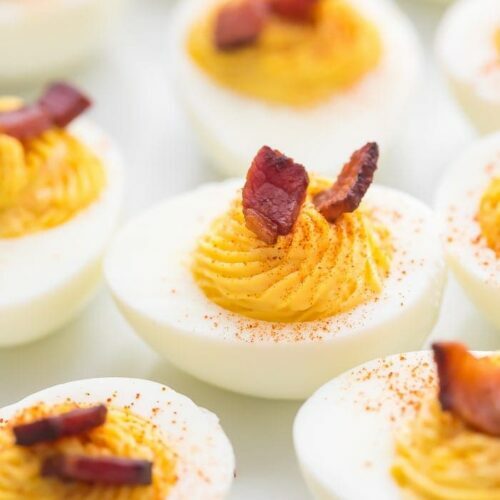 Let’s not go crazy, but just a touch of bacon on the top does a few things: it adds a little bit of crunch and needed texture, a bit of saltiness, and some smokiness that goes beautifully with these perfect deviled eggs. A couple special ingredients make the filling creamier than ever. 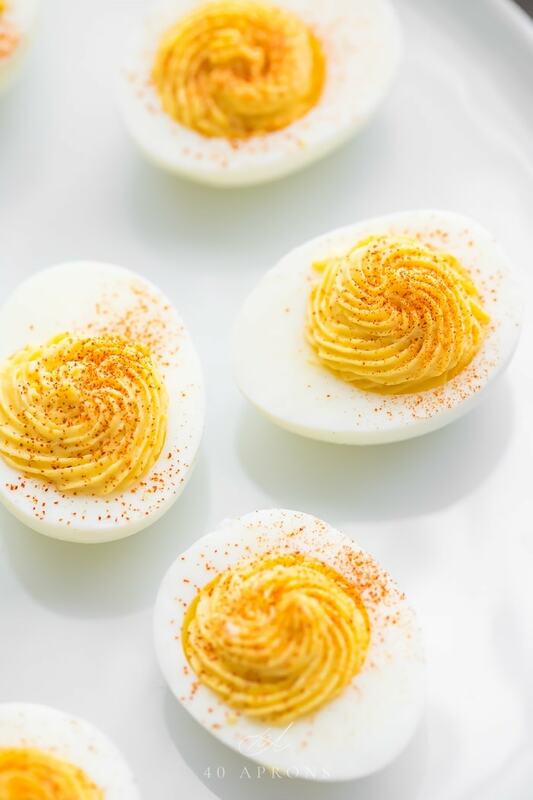 These deviled eggs are perfectly seasoned with the right amount of Dijon mustard, vinegar, and salt. They’re really quick and easy! Little crisp pieces of bacon on top add a lovely crunch and texture, but they’re not “bacony.” Oh, and you can totally leave them off! Leaving the bacon off doesn’t make these perfect deviled eggs any less perfect. 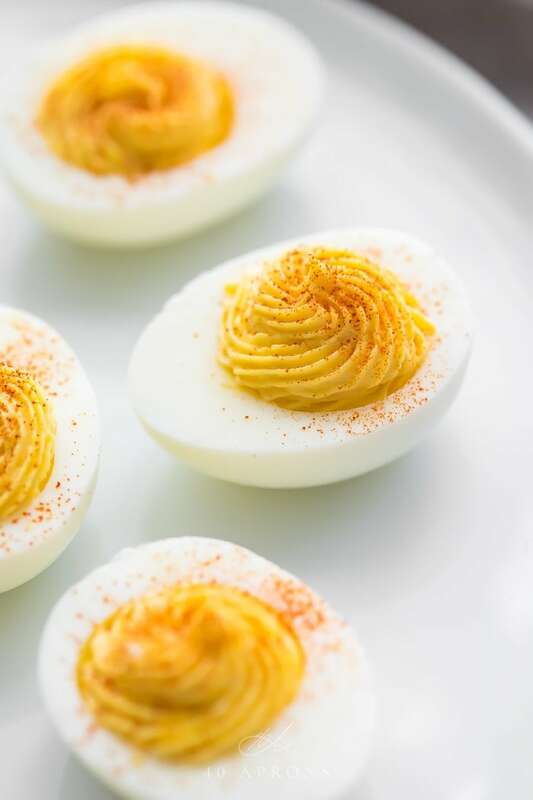 What Makes These Deviled Eggs Keto? There are 0g net carbs. Hoorah! There are 14g fat. They’re basically little fat bombs! There are 6g protein. They make a great breakfast; 4 deviled egg halves would total 12g protein, or about 10-15% of your daily total protein intake. Start by making perfect hard-boiled eggs. My article Perfect Easy Peel Hard and Soft Boiled Eggs is all you need! Boil the eggs for 12 minutes. See the Note in the recipe for the quick and dirty. Peel the eggs when they’re chilled and slice in half. Scoop all the yolks out of the egg whites into a small bowl. Mash them finely with a fork. The more they’re mashed, the smoother the filling will be. Stir in the mayonnaise, Dijon mustard, vinegar, and salt until smooth. Transfer the mixture to a piping bag with a wide open tip or open star tip. Pipe into empty egg white halves. Alternately, use a spoon to scoop the mixture into the egg whites. Sprinkle with a dusting of smoked paprika and top with a couple pieces of crisp bacon. Deviled eggs are best served right after assembling, but you can make the filling ahead of time. Keep the filling in an airtight container in the fridge for 1 day, maybe 2, and pipe soon before serving. Leftovers can be kept in an airtight container for a couple days. Can I leave off the bacon? Absolutely! I love the added little crunch, saltiness, and smokiness the bacon provides, but you won’t be missing out (too much!) if you leave it off. 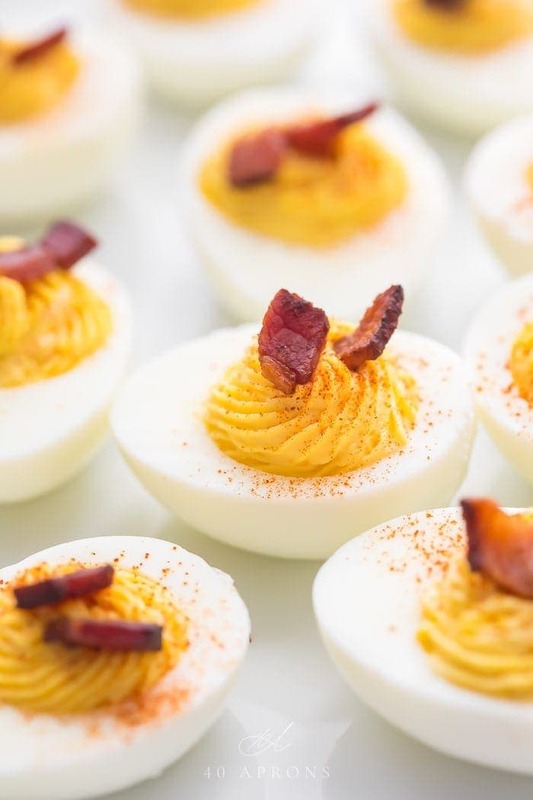 The richest, creamiest deviled eggs with a crispy, smoky touch of bacon on top! These might just be the best deviled eggs you've ever had, and they're so crazy easy and quick, too. This recipe is very easy to increase or reduce in quantity as necessary. Use the ingredients above as your starting point. See Note 2 for quantities for 1 dozen eggs. With a sharp knife, cut eggs in half. Tip: use a damp paper towel to simply wipe off excess yolk on knife between each egg. Cleaning the knife between each egg keeps the white of the deviled egg cleaner. Remove all yolks and transfer to a small bowl. Mash with a fork until the yolks become the texture of small, consistent crumbs. The more you mash, the smoother the final deviled egg. Stir in Dijon mustard, white vinegar, mayonnaise, softened butter, and salt. Adjust to taste, adding more mayonnaise, vinegar, or salt as desired. Transfer mixture to a piping bag fitted with a round or wide open star tip. 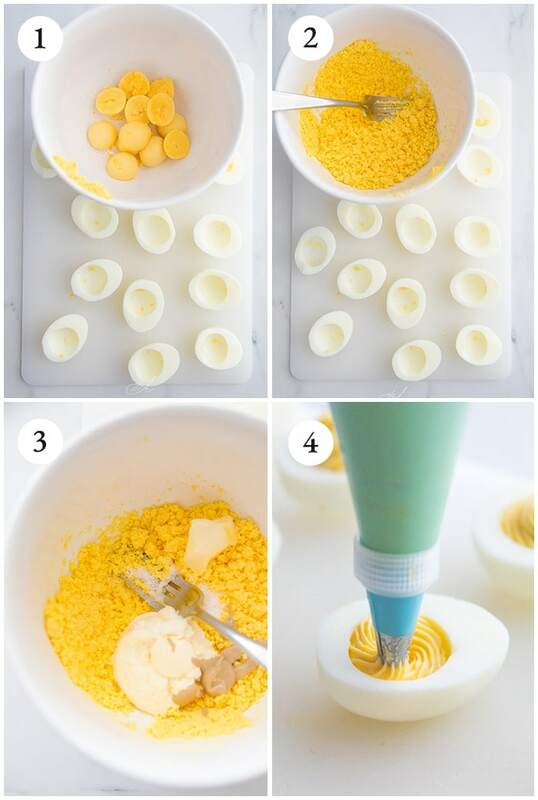 Pipe yolk mixture into egg whites in a swirl shape. Alternately, simply evenly spoon the yolk mixture into egg whites. Top with a sprinkle of smoked paprika and 1-2 small pieces of bacon. Serve filled deviled eggs right away. You can make the yolk filling a day ahead, but don't pipe or fill the egg whites until shortly before serving, for best results. Store leftovers in an airtight container in the fridge for 1-2 days. Fill a saucepan with enough water to cover the eggs. Choose a saucepan that will fit all eggs in one layer. Add a glug of vinegar (any kind) and a couple big pinches of salt. Bring water to a boil. When the water is boiling, very gently lower eggs into saucepan. Set timer for 12 minutes. Immediately transfer eggs to an ice bath. Let cool in the ice bath for at least 5 minutes to fully cool. Drain ice bath. Vigorously jiggle the bowl or pan with boiled eggs, shaking them against the sides of the vessel and one another. Toss them up an inch or so until shells are well cracked and feel almost like mesh. Peel under running water to easily flush away small stuck pieces of shell. Read my article Perfect Easy Peel Hard and Soft Boiled Eggs for more information. To make these deviled eggs Whole30, make sure the mayonnaise, Dijon mustard, and bacon are compliant. Make sure you use ghee instead of butter. I love these kinds of appetizers! I like that you used the pastry tip to make the filling so pretty! I love this – bacon and eggs made into finger food. I love the addition of butter, so decadent and these definitely look perfect! I loved the addition of butter in these. I’m not sure I’ve done that before, and I think it made a big difference in the texture that I preferred. Also, I love butter. 😉 Thank you, love this recipe! Everything is better with bacon, right? Love that you put some vinegar in here for a nice tang. I’ve never added butter to my deviled eggs, but why wouldn’t I?! My girls love these – I’ll be making them soon! Thanks! Crispy bacon and creamy deviled eggs are such a perfect combo. SO yummy! Those look so perfect! That is some top-notch piping skill right there. And you totally sold me on the addition of butter. Pinning for the next time I make deviled eggs. Of course, how could they NOT be perfect with bacon? 😀 They look delicious! Deviled agg perfection with a twist…I love trying new versions of this classic…it was So yummy!